Inside a Bierzelt ("beer tent"), Oktoberfest 2005. The Oktoberfest (also called Wiesn) is a German festival that takes place on the Theresienwiese, a public place in the center of Munich. It is every year, from the end of September to the beginning of October. It is a big social event. There is lots of eating and drinking. It is on for sixteen days ending on the first Sunday in October. If this is the first or the second the festival is extended to the end on 3 October, the Day of German Unity. This is the day when East Germany and West Germany joined into one country again in 1990. The first Oktoberfest was on 12 October 1810. The feast was for the wedding of King Ludwig I of Bavaria and Therese of Sachsen-Hildburghausen. The feast lasted for 5 days. There was music, eating and drinking. At the end of it there was a big horse-race. The next years they had this horse-race and the feast again, because the people had liked it so much. 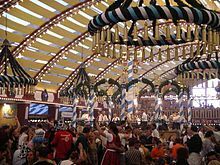 Today the Oktoberfest is the world's largest fair, and it has become very famous and popular. About six million people visit it every year. Many people and tourists from all over the world come to Munich for Oktoberfest. Other cities have copied the Oktoberfest, and now they also hold feasts that are similar to the Oktoberfest. One of the famous attractions is a big dipper called the "Wilde Maus" which means "Wild mouse" in English. There are 14 main tents at the Oktoberfest. Wikimedia Commons has media related to Oktoberfest. This page was last changed on 16 May 2018, at 00:47.